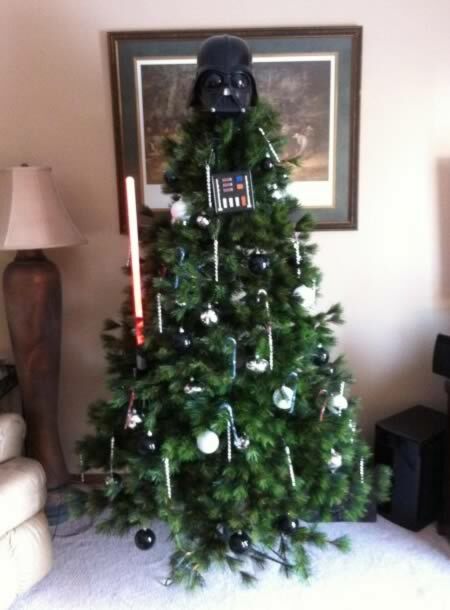 This Star Wars-themed Christmas tree has gone to the Dark Side. I believe the only light is the light saber! Greg Horn (famed cover artist for Marvel, DC, etc.) 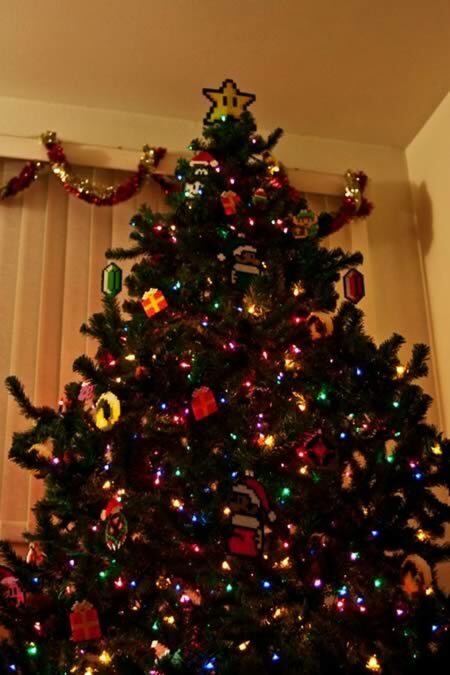 crafted a Christmas tree, the likes of which only exist in the eggnog-fueled fever dreams of geeks and Nightmare Before Christmas fans. After seeing this, you're gonna want to just throw all your old holiday décor into the trash!... or not; but, you have to admit that it's pretty cool! Add many friends the next holiday season and celebrate the things you like with Facebook ornament designs from Social Meteor. 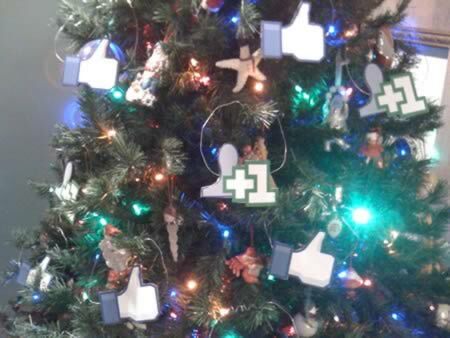 Spruce up your Christmas tree with Facebook-inspired “add a friend” and “like” ornaments. 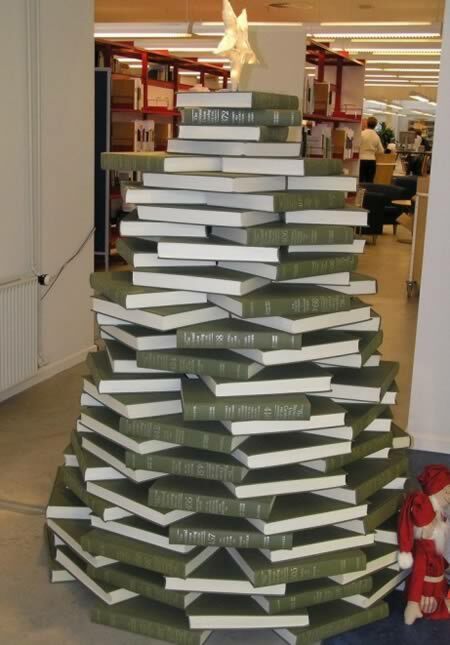 This tree would look great on a library. A Lancashire community has created an unusual centrepiece to a Christmas Tree Festival - a knitted tree. The 18ft (5.4m) tree at Poulton-le-Flyde Methodist Church was one of 46 shown at the festival. It was knitted by church members, residents of a retirement home and a library knitting group. 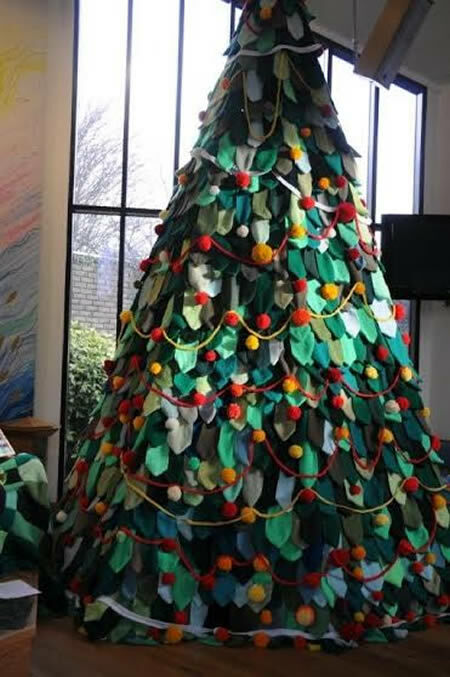 Church member Beryl Moran said that once Christmas was over, the tree would "be taken apart and stitched together to make blankets". 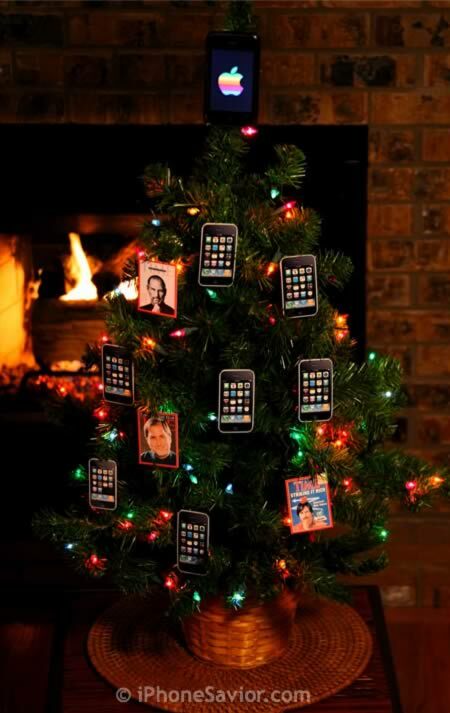 The guys over at iPhone Savior have decided to decorate thier Christmas tree this year with some fun iPhone decorations, as well as some fun Steve Jobs magazine covers. 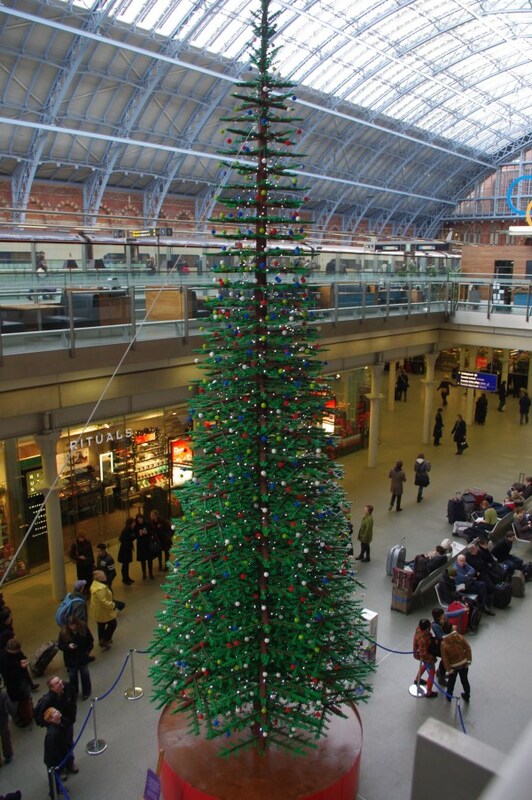 Measuring 10 meters tall in non-freedom units, this Lego Christmas tree is thought to be the biggest of its kind in the world. It's composed of over 600,000 bricks, has a thousand baubles dangling from its 172 branches, and is now lit up by a classic garland of LED lights. After two months of construction, it has been unveiled to the public in St Pancras International Station this week, and even the typically jaded Londoners are finding themselves wowed by its blocky intricacy. 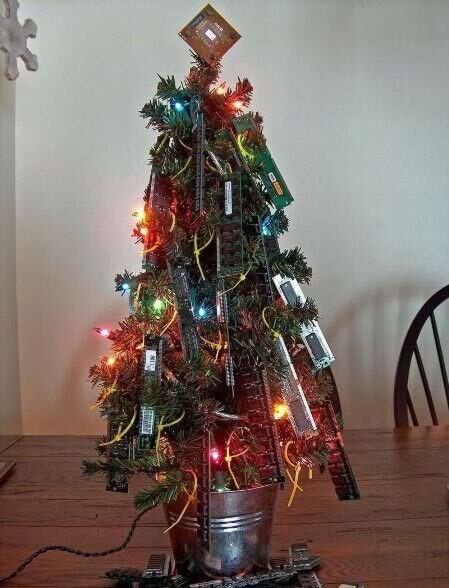 Only computer nerd(ettes) can appreciate a Christmas Tree like this one. This a most excellent way to display all those RAM memory sticks that were strewn everywhere! Red and Jonny are some of the world's most famous Star Wars geeks thanks to their delightful Flickr stream and popular blog. 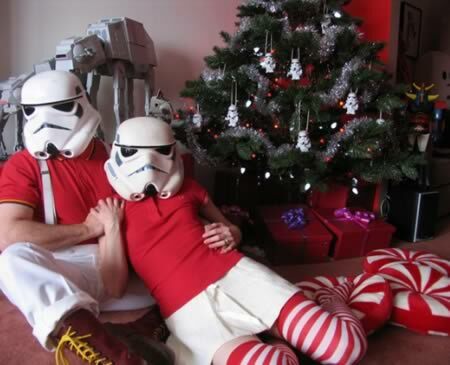 Here is one of their best Christmas photos from 2010, featuring the couple posing in front of their pet AT-ATs and their Christmas tree covered in tiny replica stormtroopers.